However, the benefits of inbound marketing go beyond just SEO. 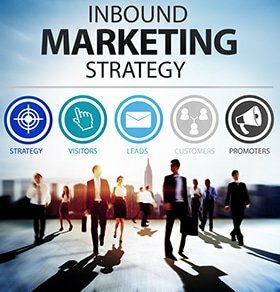 Inbound marketing can also captivate the attention of customers, draw customers into your website, and influence them to purchase your products or services. To put it plainly, inbound marketing can boost your sales, profitability and ultimately your bottom line. Even then, the benefits of inbound marketing don’t come by default. They arise from careful planning, preparation and execution of certain marketing activities. The first step towards this is developing an inbound marketing strategy. In a nutshell, an inbound marketing strategy is simply a systematic attempt to harmonize inbound marketing activities in order to achieve specific business goals. These goals could include brand enhancement, attracting more customers, increasing sales, improving market share, repairing or enhancing your online reputation, and increasing SERP rankings. The marketing strategy basically organizes different marketing activities in order to achieve such goals. We shall look at a few marketing activities later but first, let us consider the key components of a marketing strategy. – a marketing strategy must be aimed at achieving specific goals. Examples of the possible goals have been mentioned above (i.e. brand enhancement, increasing sales, etc). Without specific goals, the strategy won’t be effective. – having specific goals isn’t enough, you need specific measures for those goals. This is what success indicators are. These basically tell you whether or not you have achieved the goals. Examples of success indicators include: number of visits to a landing page, number of customers signing up for a product/service, SERP rank, etc. – once you have the goals, and success indicators, you now need a plan to make things happen. This is what a marketing plan is. This describes the activities, timelines, targets, budgets, and so on. A good marketing plan should be an execution plan i.e. contain actions delivered a step-by-step approach for achieving goals. – once you begin executing your marketing plan, you need a way to track your progress. This is where Monitoring and Evaluation comes in. M & E enables you to assess the impact of different approaches or activities, and make adjustments where need be. Ultimately, this can increase your chances of success. Inbound marketing is basically a systematic approach used to attract people to your website, convert them into customers, and keep them coming back for more. In most cases, it involves a four step process: attraction, conversion, closing, entrenchment. Attraction – this basically uses a number of techniques to bring strangers to your landing page. Conversion – once strangers come to your landing page, they are now your visitors. You now have to convince them that you have something they need. Once they are convinced, they become leads. Closing – the next step is getting them to sign-up for your products or services. This changes them from leads, to customers. Entrenchment – once a person makes a single purchase, you need to keep them coming back for more. Entrenched customers can also tell others about your products or services. To successfully carry out the inbound marketing process, there are a number of core principles that you need to keep of in the back of your mind. The four most critical are: content, user experience (UX), backlinks and analytics. The most important aspect in inbound marketing is having great website content. There is no way around this. Inbound marketing is about drawing people onto your website, and retaining them. The only way to achieve this is having content which is relevant, engaging, and well crafted. At a minimum, having great content means that your website copy is well-written, and perfectly illustrated with vivid graphics, pictures and videos. Other avenues of great content include blogs, newsletters, eBooks, white papers and podcasts. In a few cases, the definition of “content” can be stretched to include physical products like free samples, and branded T-shirts (https://en.wikipedia.org/wiki/Inbound_marketing). In most cases though, the content is electronic. Also, in most cases, the content is given out for “free” in exchange for something from a visitor e.g. giving you their email address. Great content ensures that whoever visits your website not only stays, but keeps returning. Now, content is an aspect of UX. However, website UX also includes non-content aspects like page loading speed, mobile access and mobile-friendliness, ease of navigation and the attractiveness of design. Such aspects can determine whether or not a visitor remains on a page. For instance, if your landing page loads slowly, or looks distorted when viewed from an iPhone browser, then most people will simply navigate away from it. This will increase the page’s bounce-rate. As such, you will not only miss out on potential customers, the high bounce rate ultimately hurts your SEO efforts. And if we’re talking about SEO and ranking higher in Google, remember that Google strives to make sure they rank websites where users have an overall good experience. So if a page loads slow or does not render properly over a smart phone or even over a particular major browser then that just means people will leave your site quickly and that doesn’t bode well with anyone including Google. The bottom line is that a good UX is invaluable for inbound marketing. At the least, it enables visitors to stay long enough to notice your great content. Without a good UX, having great content is redundant because the majority of visitors won’t stay long enough to notice it. Read 10 Absolutely Crucial Things Every Website Design Needs. Backlinks (aka inbound links) are the cornerstone of inbound marketing. In fact, every inbound marketing activity is aimed at generating backlinks. As such, understanding the ABCs of backlinks is critical for overall success of inbound marketing. Not all backlinks are evaluated equally by Google. There are “good” backlinks, and “bad” ones. Good backlinks can improve your SEO, but bad backlinks can cause your website to be downgraded in SERPs or even removed from the Google index. The ultimate question is: “what makes a backlink good or bad?“ Well, the most important thing is relevance, authenticity and reliability of the backlink source. At a minimum, a good backlink should come from a website which is relevant to your website’s content. For instance, let’s say that your website sells guitars. A backlink from a guitar enthusiasts’ blog, a music school website or jazz band website can be considered “good”. This is because their content is directly or indirectly related to yours. However, a backlink from a website which sells baby shoes or offers web design services can be considered “bad”. This is because their content is totally unrelated to yours. Quality of content – does the website contain good content, or is it considered “spammy” by search engines? Security – does the website have a reputation for being used by hackers to attack others? Search Engine Indexing – is the website indexed by search engines? Or has the website been penalized for using blackhat techniques. Having good backlinks isn’t enough. The anchor text on the backlinks needs to be formatted right. Now, Google’s policies towards anchor text are always shifting. Even then, there are two major guidelines for creating great anchor text. The first is variety. The natural thing is to want to include your keyword in every anchor text. This is a bad idea. Google punishes this severely. You need a variety of words or phrases in your anchor text. You can use synonyms, variants of your keyword, or even unrelated phrases. Just don’t include your target keyword on every anchor text. The second is grammar. Your anchor text should fit “naturally” in the context in which it is included. At a minimum, it should make grammatical sense. If you insert anchor text in unusual or unnatural ways, you can get punished. Now, there is more to anchor texts than meets the eye. For a more in-depth look at anchor texts, please check out this article by Nathan Gotch – https://www.gotchseo.com/anchor-text/. The ultimate question is: “how can you get backlinks?”. Well, there are number of techniques used to get backlinks. In fact, the techniques are usually described as “black hat”, “grey hat” and “white hat” techniques. The white hat techniques are the ones which are legally approved by search engines, so that’s what we will focus on. If you want information about black or grey hat techniques, there are numerous online guides. Just know that if busted by Google, your website could be seriously penalized. The last component of inbound marketing is analytics. This is basically used to track, measure and evaluate the progress of your marketing activities. Analytics is essential for refining your marketing efforts. It can enable you to measure the success of your efforts. It can also enable you to notice what is working or not working and make the necessary changes. There are a number of tools which can help you with both data collection and analytics. Examples of these tools include: Majestic.com, Ahrefs.com, Moz.com, SpyFu.com and SEMRush.com. Such tools can help you to carry out all the analytics necessary to make informed decisions. As you’ve probably noticed, creating and executing an effective inbound marketing strategy isn’t a piece of cake. It requires not just a high level of knowledge and skills, but also a good investment of time and effort. The good news is that you don’t have to do it yourself. You can easily hire an inbound marketing expert to carry out everything for you. Such an expert will save you time, money and stress. If you desire to hire an inbound marketing expert, please call our staff today at 303-200-1000 or by email at sales@seozones.com and let us know how we can help. How about taking the next step and receive a FREE analysis of your website? Just fill out the form on this page and we will send you a detailed report of all backlinks going to your website. See for yourself if your website falls in line with Google’s expectation of having good backlinks or if there are any spammy links linking to your site that could be potentially hurting your rankings in the SERPs.